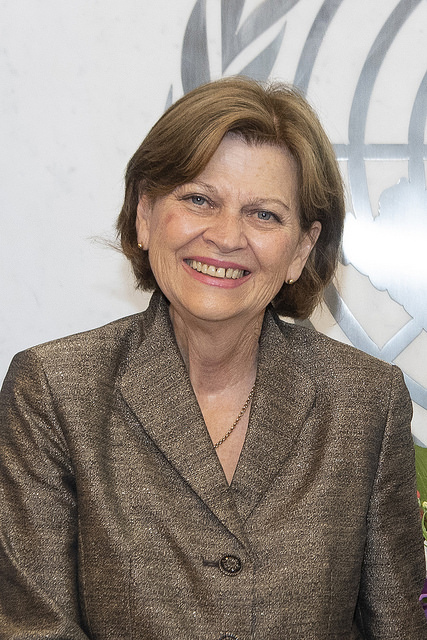 Appointed on 1 August 2018 by Secretary-General Guterres as his Special Representative for Haiti, Ms. Helen Meagher La Lime took office on 3 September 2018. Ms. La Lime succeeds her compatriot Susan D. Page, to whom the Secretary-General is grateful for her dedicated service and effective leadership of MINUJUSTH. The Secretary-General expressed also his gratitude to his Deputy Special Representative, Dr. Mamadou Diallo of Guinea, who served as Officer-in-Charge of MINUJUSTH during the past months. Ms. La Lime graduate of the National Defense University in Washington D.C. and holds a bachelor’s degree in Languages and Linguistics from Georgetown University. In addition to English, she is fluent in French, Spanish and Portuguese. United Nations Secretary-General António Guterres announced on 20 September 2017 the appointment of Mamadou Diallo of Guinea as Deputy Special Representative of the UN Mission for Justice Support in Haiti (MINUJUSTH). Mr. Diallo also serves as United Nations Resident Coordinator and Humanitarian Coordinator. Mr. Diallo succeeds Mourad Wahba of Egypt, who stepped down from his duties in January. The Secretary-General expresses his appreciation for the significant contribution of Mr. Wahba to the implementation of the mandate of the United Nations Stabilization Mission in Haiti (MINUSTAH) and the coordination of the activities of the United Nations system in Haiti. Since 2015, Mr. Diallo has served as Deputy Special Representative of the Secretary-General of the United Nations Mission in the Democratic Republic of the Congo (MONUSCO), where he also served as Resident Coordinator and Humanitarian Coordinator for the United Nations and United Nations Development Programme (UNDP) Resident Representative. He brings to his new functions 25 years of experience and continuing service with the United Nations at the national, regional and international levels in peacekeeping, development and humanitarian operations. Between 2012 and 2015, he held the position of the Joint United Nations Programme on HIV/AIDS (UNAIDS) Regional Director for West and Central Africa based in Senegal. From 2009 to 2012, Mr. Diallo was the United Nations Resident Coordinator and Humanitarian Coordinator, and UNDP Resident Representative in Eritrea. He previously served as the Representative of the United Nations Population Fund (UNFPA) in Mali from 2005 to 2009 and in Sierra Leone from 2001 to 2005, as well as Regional Adviser in positions dealing with maternal and child health and family planning issues with UNFPA in Senegal and in the Democratic Republic of the Congo. Prior to joining the United Nations, he has worked as a medical doctor and Chief of medical staff in Guinea. A graduate of the Université de Conakry School of Medicine (Guinea), Mr. Diallo also holds a master’s degree in public health from San Diego State University (USA) and a special diploma in public health from the Catholic University of Louvain (Belgium). Mr. Diallo is married and has three children. After joining the Royal Canadian Mounted Police (RCMP) in 1984, A/Commr. Therriault performed front line policing and federal enforcement in communities across Canada. Amidst his varied operational work, he also had the opportunity to mentor new recruits as a facilitator at the RCMP Training Academy and to contribute to the development of the executive cadre as a human resources officer at the RCMP Headquarters. During his career, A/Commr. Therriault was selected to lead numerous multi-disciplinary teams based on personal achievements and operational successes. This was highlighted in his role as Criminal Operations Officer in the National Capital, where he oversaw investigations related to National Security, International Anti-Corruption, Drugs and Organized Crime, War Crimes and Crimes against Humanity, Cyber and Financial Crimes. In 2012, he joined the United Nations Stabilization Mission in Haiti (MINUSTAH), initially as Deputy Commissioner in charge of the development of the Haitian National Police. Two years later, he became the 9th UNPOL Commissioner of MINUSTAH, building capacity for the transition of security and policing responsibilities to the national authorities. Upon returning to Canada in 2015, he accepted the responsibilities of the RCMP’s Public Affairs portfolio, before moving to the United Kingdom in 2017, as the Senior Regional Manager for the RCMP international liaison program in Europe, the Middle East, and Africa. Since October 2018, A/Commr. 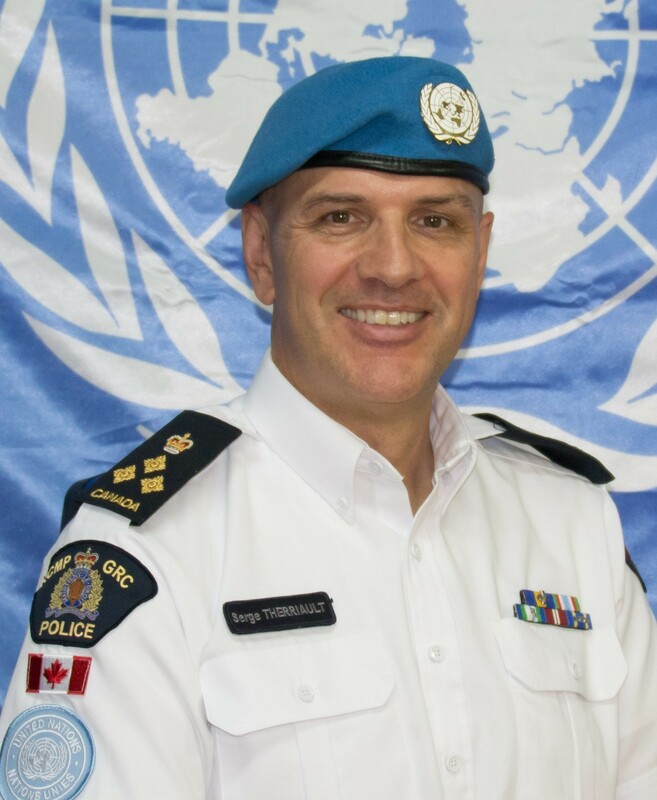 Therriault has rejoined the United Nations as UNPOL Commissioner for MINUJUSTH, where he assists the Government to strengthen rule of law institutions in Haiti, by supporting and contributing to the development of the HNP. In addition to his extensive administrative and operational policing experience, he holds a Master’s Degree in Public Administration and he is a Member of the Order of Merit of the Police Forces. He is married and the proud father of three young men.